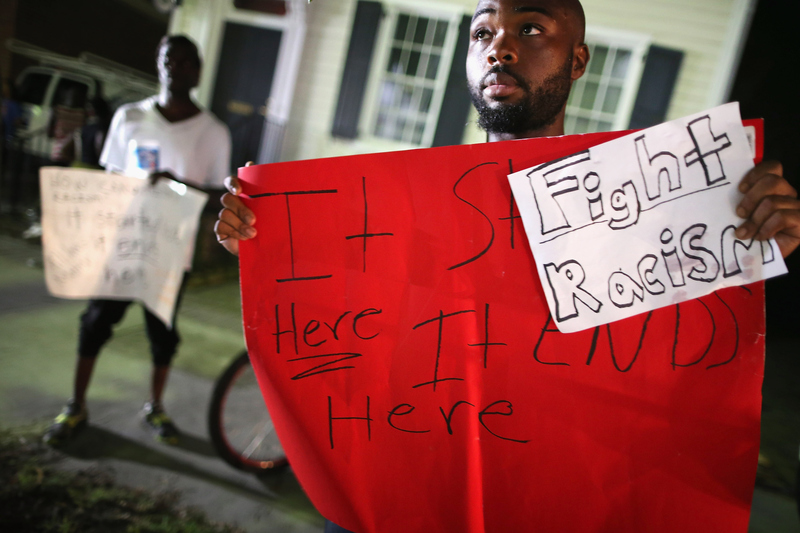 Americans Are Worried About Racial Inequality, So ... Now What? A majority of Americans say that more needs to be done to guarantee equal rights to African-Americans, according to a new poll from The Washington Post. In contrast, a similar Pew Research Center poll from this time last year found that only 46 percent of people thought that more needed to be done to achieve racial equality. Following a year of highly publicized killings of unarmed black people at the hands of white police officers, people from various racial backgrounds are less optimistic about the country’s promise of racial justice, and are more convinced that anti-black discrimination is alive and well. The Washington Post data, released Tuesday, joins a series of opinion polls from this summer that reflect heightened concern over the nature of race relations, as well as the persistence of anti-black prejudice. This should be credited in part to the success that anti-racist activism like the Black Lives Matter Movement has had raising white consciousness around anti-black police violence. No wonder that a July poll by the New York Times and CBS found that Americans regard the state of racial relations in a more negative light than they have since 1992, after Los Angeles erupted in days of rioting after police brutally beat Rodney King, an unarmed black man, on camera. According to the new poll, a clear 57 percent of Americans thought that the relationships between the different communities were “generally bad,” as opposed to only 45 percent who thought so 14 months before. Oddly, more than three-quarters of Americans see these racial tensions as happening elsewhere; whites, blacks, and Latinos alike view the race relations within their own local communities as generally good. The consistent views about race and racism in our own backyards points to the power of the news media to shape Americans’ consciousness about the issues that are the most politically or ethically urgent. But The Washington Post and NYT/CBS polls are clear: Today, more Americans recognize persistent racial injustices and support programs like affirmative action to redress those longstanding inequalities than in recent years. In 2014, before the trauma of Ferguson, only four out of every 10 whites thought that the United States had more work to do before it provided black citizens with the same rights as their white counterparts, according to The Post's data. But this July, that number had climbed to 53 percent — a narrow majority. In turn, black views on the yet-as-unfilled promise of racial equality have doubled down in the last 12 months, as the percentage of African-Americans who see U.S. society as unequal in terms of rights has climbed 11 points, to 90 percent. Among Latinos, the data shows that nearly 70 percent now think that the country can do more to provide blacks with equal rights, a jump of 15 percentage points. Aside from a respondent’s race, the biggest predictor of whether or not an individual thinks that more changes are needed to assure equal rights for African Americans is political affiliation. Almost four out of five Democrats and 62 percent of independent voters see room for improvement on racial equality. In turn, only around a third of Republicans think that is the case, whereas the majority of GOP voters said that we have done enough on the question of equal rights. But among Republicans, opinions have shifted over the past year, as seven percent more GOP voters identified worries around ongoing racial disparities. The Washington Post data dovetails with a similar survey conducted by CNN in June that highlighted the public’s rising consciousness around anti-black discrimination. According to that poll, 37 percent of Americans now think that racial discrimination is a “very serious” issue, compared to a mere 16 percent the year before. But it is worth noting that the schism along racial lines is quite deep on the question of discrimination. An overwhelming four-fifths of the African-American community labels it a serious problem, compared to less than a third of whites. Even as more whites acknowledge that race still matters when it comes to determining an individual’s life chances, The New York Times / CBS poll from July still shows that a majority of U.S. whites — 55 percent — believe that people have an equal shot at making it in contemporary America, regardless of their skin color. Whites and blacks in America still don’t see eye to eye on race, particularly when it comes to characterizing and responding to incidents with racial overtones. For instance, the two communities were largely divided on a grand jury’s refusal to indict Officer Darren Wilson for shooting and killing Michael Brown last August. According to a poll by The Washington Post and ABC from last fall, 35 percent of whites thought that the grand jury’s decision not to indict represented an injustice. In comparison, 85 percent of blacks thought so. Similarly, the lack of an indictment over Eric Garner’s death by a NYPD chokehold earned condemnation from 91 percent of African Americans, but only struck 49 percent of whites as problematic. The vastly different experiences of whites and blacks in the criminal justice system go a long way towards explaining these disparities. Four out of every 10 African Americans have reported being stopped by an officer for suspect reasons, compared to only one in every 20 whites, according to the NYT/CBS poll. Opinion polls are a notably unstable indicator of the shifts in public views, as the pollsters increasingly struggle to find representative samples of the population to collect data from. Not to mention that the poll format — most often, a series of tightly worded yes-or-no questions — doesn’t get the public’s opinion, broadly speaking, on issues like racial equality, but instead aggregates how individuals would respond to more limited questions, like whether discrimination is a “very serious” as opposed to simply a "serious" issue. But the consistent and substantive change in Americans’ views on racial inequality and the presence of anti-black prejudice indicate that the events of the past year have unsettled some comfortable narratives about a post-racial United States in which people enjoy the same life chances, regardless of skin color or background.